How to use Ebook Central to browses and view the a wide assortment of books from scientific and technical publishers. Welcome! ProQuest EBook Central provides CSHL researchers and staff an easy way to discover and read a vast collection of scientific and technical books from leading publishers, courtesy of CSHL Library. After 5 minutes, you will be prompted to you want the CSHL Library to purchase the book. If the book is useful, please complete the request with your name and phone number. A CSHL Librarian will then process your book request. Once the book is purchased, you will be able to read for as long as your want and printout chapters. 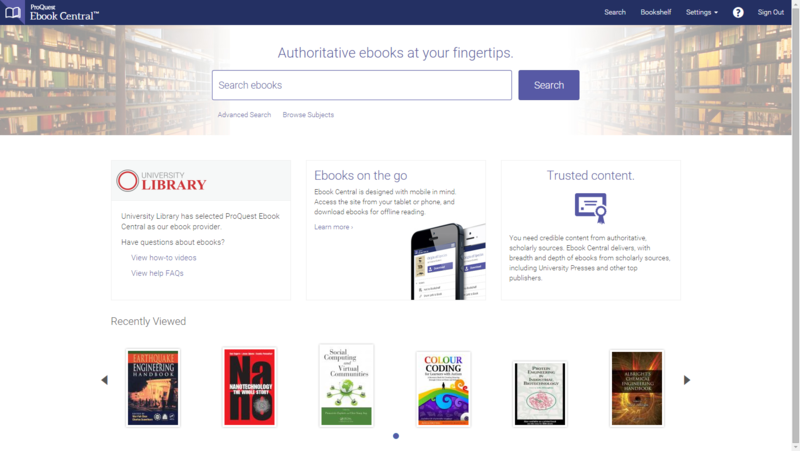 While not required, creating an Ebook Central account on the will allow you to: request book for purchase directly to the CSHL library, create a bookshelf, bookmark passages and draw highlights within the ebook. EBook Central provides an easy way to discover and read a vast collection of scientific and technical books from leading publishers. This guide created by ProQuest and slightly modified for CSHL specific information.